This level has medium difficulty and you need to use good technique to complete this level. For this level you should try to play from the bottom to break blockers and shuffle candies to get special candies. 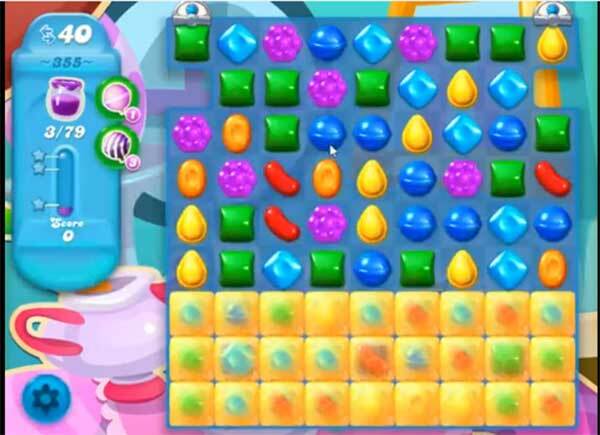 Try to combine special candies to each other to spread the Jam within less moves or play near to Jam candies to spread them to near candies to complete the level. Agree with Paul. No color bombs on android version. Without them the level is pretty much impossible unless you want to pay $$$$ to keep playing. Yup… problems with the mobile version. I rarely play on my desktop, but I did for 353 and won it in two tries. I’ll have to do the same for this one until they fix it. awful! playing on pc, used my boosters, just wasting time, can’t clear coloring candies, can’t make striped candies, only match 3 at a time. Monotonous. No point in buying boosters because still won’t work!!!! 353and355 there are no speacials in the upper legt and right corners at the i phone and i pad. Only at the computer but that is also not correct. Speed up update Please ! THIS LEVEL IS AWFUL AND APPARENTLY ALMOST IMPOSSIBLE TO COMPLETE ON YOUR MOBILE. WELL, I DON’T PLAY ON MY PC. ONLY MOBILE. TODAY I READ ABOUT COMPLETING IT ON MAIN FRAME. ANYHOW, AFTER A WEK AND AT LEAST 100 TIMES AN ACT OF GOD HAPPENED AND I got a color ball that i mayched with a stripe and finsihed it with ease. You must get a cpecific colir bomb that changes the color of whatever you maych it with. This is THE ONLY WAY TO V OMPLETE ON MOBILE. I’m on my kindle and there are NO color bombs anywhere. Well last night I completed this level on my Kindle and 2 seconds after I got the last jelly, the game went off and my Kindle screen came on and wouldn’t you know it did not register my completion of this level. I don’t know how many times I tried it, and I was so relieved until that happened. Then I was just frustrated and annoyed. I am a novice but after a lot of tries I did it. awful level. On my Android tablet, I 1st concentrated on popping 3 in the top corners to get color bombs while popping matching candies to clear bubbles on bottom. Also making any special candies I could. Use every color bomb you get right away to keep clearing the top corners. They don’t always provide more. When special candy matches happen in jelly use those right away to spread jelly. I finally after days of trying got jelly into the color bombs in the corner, which allowed me to spread jelly over a wide range. At the same time it set me up with the brown color speckled bombs in the jelly- right next to special made candies. 2 of those and I was through. Good luck! Was terrible! 😀 Don’t use up your boosters…it’s a waste! Just do it Over&Over. Also I’m not sure if made a difference…but when you lose & get “Retry”. X out & go to your level trail- click on your level & reload. I did this twice in the end & maybe that reset the level. This is one hard level to conquer. The tips say to play from the bottom, but that isn’t always possible. I can get it to 72 but not the 79. This is so frustrating. Level 72? I can’t get past the teens. Says to play from bottom up but all of my matches are 3 colors, in the top 3 rows! How in heck are you supposed to even get to the jam in the first place? Even when I do make it to the jam, I’m down to less than a few moves. I get the color bombs but they don’t do any good, just give combos of 3. Obviously others have beat this level but who wants to play it 150 times?